By using Harvard’s Odyssey high-performance supercomputer and new software called Arepo, a team of scientists developed a new computational approach that can accurately follow the birth and evolution of galaxies. Scientists at the Harvard-Smithsonian Center for Astrophysics (CfA) and their colleagues at the Heidelberg Institute for Theoretical Studies (HITS) have invented a new computational approach that can accurately follow the birth and evolution of thousands of galaxies over billions of years. For the first time, it’s now possible to build a universe from scratch that brims with galaxies like those we observe around us. “We’ve created the full variety of galaxies we see in the local universe,” said CfA’s Mark Vogelsberger, a postdoctoral fellow in the Harvard College Observatory. Our cosmic neighborhood is littered with majestic spiral galaxies such as the Andromeda, the Pinwheel, and the Whirlpool. Spirals are common, but previous simulations had trouble creating them. Instead, they produced lots of blobby galaxies clumped into balls, without the broad disks and outstretched arms of a typical spiral. The new software, called Arepo, solves this problem. Created by Volker Springel, group leader at HITS, Arepo generates a full-fledged simulation of the universe, taking as input only the observed afterglow of the big bang and evolving forward in time for 14 billion years. “We took all the advantages of previous codes and removed the disadvantages,” explained Springel. “Our simulations improve over previous ones as much as the Giant Magellan Telescope will improve upon any telescope that exists now,” said Debora Sijacki of the CfA and a fellow at the Harvard College Observatory. One of Arepo’s key advantages is the geometry it uses. Previous simulations divided space into a bunch of cubes of fixed size and shape. Arepo uses a grid that flexes and moves in space to match the motions of the underlying gas, stars, dark matter, and dark energy. The simulations ran on Harvard’s Odyssey high-performance supercomputer, using in total 1,024 processor cores. This fast machine allowed the scientists to compress 14 billion years into only a few months — an endeavor that would have kept a desktop computer busy for hundreds of years! The team’s future goals include simulating much larger volumes of the universe at unprecedented resolution, thus creating the largest and most realistic model of the universe ever made. 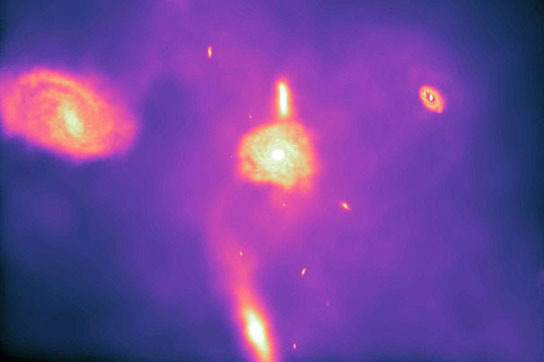 Be the first to comment on "Arepo Software Helps Simulate the Birth and Evolution of Galaxies"